I figured since it's the end of January and I've been in this dorm room since August, it's about time I share my real life space with you! I've been very fortunate this year to be able to live in a newer, bigger dorm this year, and I really love it. 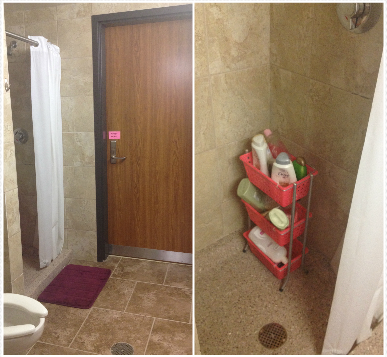 It's smack in the center of campus right between the union and the bookstore and has a connected bathroom, which has greatly improved my dorm experience! This is my closet! I have a chest of drawers this year, which you'll see later, but that gives me so much more room in here! I have a divider in so I can hang my shorts and skirts separately (which is a huge space saver). At the top I have a small shelf so I store my towels and blankets there (and my yoga mat because I'm just so sporty #neverbeenused), saving space in my drawers, which is where I kept them last year. My favorite thing about my closet divider is all the cheeky things it can hide, shhh! I have a love hate relationship with my desk. It comes in two parts and I used one as a night stand since it wouldn't fit in this little nook by the window. It is constantly becoming cluttered which distracts me, so I try to clean it off at least once a week, which makes me much more productive! Stacking = wonderful. I stack my pens and notepads on top of my agenda and push all the small things like my candles and germ X to the very back! Biggest tip? Get a lamp…with a shade. My florescent lamp that shined right in my face last year about killed me. Btw, my dad totally got me that Queen paperweight when I moved in last year…is that not the cutest? 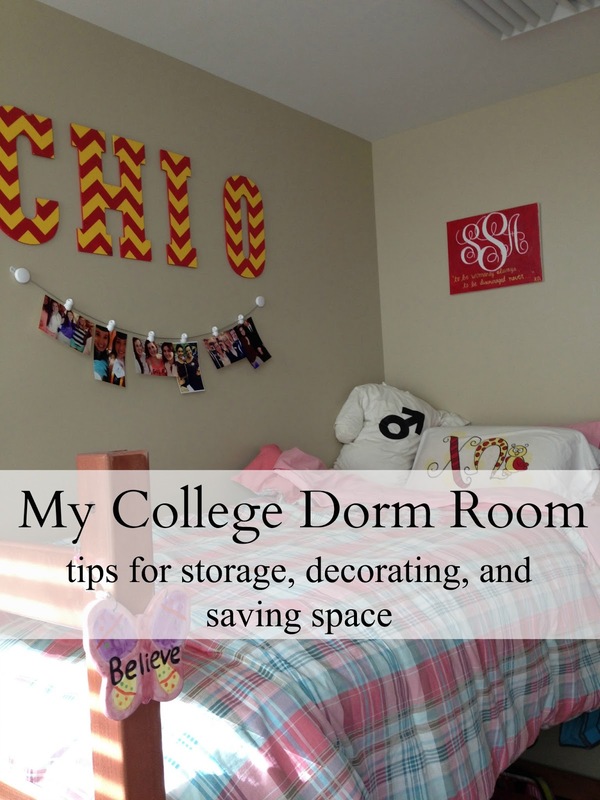 As I'm sure you've heard, storage and space management can be a bit of a problem in a dorm. To solve this a bit, I've stashed everything under my bed! Last year, I lofted my bed and had my desk under there, but I like this way much better. I have my fridge, drawers, food box (snacks and groceries), medicine/first aid box, extra pillow, weekender, and laundry stashed under there. It's nice to stack textbooks on top of my fridge and my drawers as it saves space on my desk but is easy to reach! My other snacks as well as study supplies are kept in those drawers on my window sill. I keep pencil cases and notecards in some drawers and then in others I have snacks, granola bars, and crystal lift packages. The drawers are also great to put my TV on. It's the perfect height to watch from my bed! I also keep my (illegal) candles and toaster on my window sill and my absolute favorite part is that when I need to, I can pull the curtain and hide all of it! Oh, my bathroom. So, a few months ago when I originally planned to post this, I cleaned so you guys could see my vanity and sink area. I took a super clean pic showing all the things I used to have up there, but as you can see on the right, products have taken over. At least we've got lots of space, right?? My bed! This is my favorite part of my whole room. I love how I have it situated and decorated this year and how it's tucked away in a corner so you can't see me when you first come in the door! The letters are hand painted that I got from my big and the canvas above my bed was a DIY project using my sorority colors and motto. My pictures are hanging on my "owl line," yet another sorority reference of course! I really tried to incorporate loads of pictures and things from home as I got really home sick and went home lots last year, and am trying to do that less now (to prepare for England, as that'll be major homesickness)! If you want to see what my cork board at home looks like (it's much cooler), click here. What are your dorm room tips/experiences? I love blogposts like this so we can be nosey (or interested!) When I lived on campus at university, I was forever found under huge piles of clutter, although not much has changed now I've moved back to my parents house since graduating! Your storage ideas have been really useful - thanks! YAY!! I absolutely love your dorm room and I'm so jealous that you've got an en-suite bathroom! Sharing bathrooms has definitely got annoying by this point in the year!! Last year I had to share with my whole hall and it was horrid..so much better this time around! Glad you liked it! You are so welcome! I've meant to do this for ages! If you have any questions, email me! I have lists upon lists from freshman year…prob the only thing good to come out of my anxiety about it! This is so cute and well organized! When I lived in a dorm I took full advantage of having an en-suite bathroom. Thank you! And yes, it's probably my favorite feature besides the big windows!